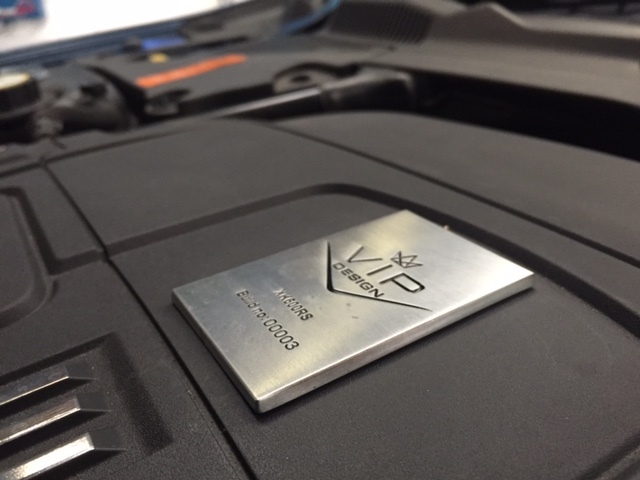 XKR Tuning: VIP Design London had the pleasure of carrying out its Jaguar XK 650bhp ‘Vantablack’ conversion last week. The 5.0 litre Jaguar XKR was treated to a series of Jaguar styling upgrades, Jaguar XKR tuning and performance part upgrades to substantially increase its power and performance. XKR Tuning : The Jaguar XKR was given a software upgrade to the ECU, a performance ECU remap to give it an astounding 650bhp, making it a true sports car in disguise. The performance ECU remap was complemented by the addition of high-flow air filters, which increase the air intake into the engine and improve combustion, bringing the software upgrade to life. The addition of an upgraded charge cooler further complements this by cooling the air before it enters the engine for optimum power, working together with the performance ECU remap and air filters in perfect harmony. The increased power and engine combustion achieved by the Jaguar high-flow air filters and upgraded charge cooler were further enhanced by the full Jaguar performance exhaust system, including 200-cell catalytic converters. This stainless steel exhaust system aids exhaust gas cycling through the engine, working with the upgraded charge cooler and air filters to provide stunning performance while giving a sleek and refined but aggressive look to the rear of the car. The Jaguar XKR was given a set of lowering springs all round to dramatically improve its poise and stance on the road, while increasing the driver’s control, and a full set of polyurethane bushes were also added which tighten up the suspension enabling better control with the increased power of the engine. The polyurethane bushes provide the added advantage of not deteriorating when exposed to salt and debris on the road, so will not need replacing later on, as well as providing much better handling. For more information about our XKR Tuning and how you can give your Jaguar XK the full VIP Design treatment, please visit www.vip-design.london, call +44 (0)1789 774444 or email enquiries@vip-design.london.